On paper, the Kodak i780 Scanner outruns the competition with speeds up to 130 ppm. But unlike competing products, it delivers that maximum scanning while meeting real needs under real world conditions. You get true 130 ppm performance, even when scanning at up to 300 dpi resolution; in color, grayscale or black-and-white; in dual stream mode (outputting up to four images per scan); and with all advanced features enabled. Real-world performance makes the Kodak i780 Scanner the one to choose for mission-critical, high-volume forms processing across a broad range of applications. 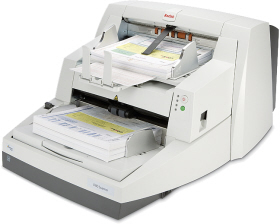 The Kodak i780 model easily scans mixed batches of business documents, photos, tear sheets and graphics. A flexible input design enables it to handle a wide range of document sizes and shapes. And an included short-document exit tray allows for efficient stacking of smaller documents. Kodak's SurePath technology delivers the paper-feeding reliability you need for uninterrupted workflowwhile ultrasonic multi-feed detection helps prevent misfeeds by recognizing labels, stick-on notes, and stuck-together documents.